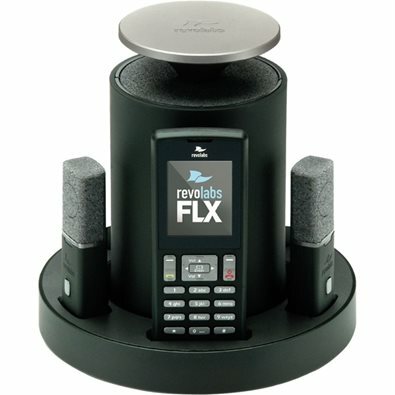 Revolabs FLX 2 is the world's first wireless POTS/PSTN and Bluetooth-capable conference phone for small to medium conference rooms and executive offices. The unique modular design provides maximum flexibility for speaker and microphone placement with a handset for dialing and private conversations. Video conferencing units and personal computers can be connected using audio in/out ports. The phone will bridge calls from a POTS/PSTTN or a smartphone connected with Bluetooth to calls from a video conferencing unit or a computer-based UC client such as Skype for Business, Zoom, Vidyo and Hangouts.The 10-FLX2-200-DUAL-POTS model comes with 2 omnidirectional tabletop wireless microphones which features 360° pickup patterns to capture all speech above and around the microphone, and impervious to GSM noise from other wireless electronic devices, secure: 128-bit encryption means no one will be able to listen in on the signal sent between the microphone and base station, an additional wireless speaker and 8 hours of talk time. Revolabs FLX2 wireless conference phone is a unique marriage of technology and ergonomic design, allowing for an unparalleled experience when making telephone calls (VoIP or analog interface), video conference calls, or using it with your Bluetooth enabled cellphone or computer to make speakerphone calls. FLX2 completely redefines the traditional design of conference phones giving you freedom and flexibility. The microphones and speaker can be placed throughout the room to optimize sound quality, while the same device unifies communications through private handsets and speaker calls. Revolabs FLX2 is an ideal wireless conferencing solution for meeting rooms and executive offices. The technology used allows the microphones, the dialer, and the speaker to co-exist with other wireless products such as wireless LANs (802.11 b/g) without interference. FLX2 conference phone includes digital encryption technology to ensure secure wireless communications between the microphones, speaker and the base station. Flexibility: Can be mixed and matched with a variety of FLX wireless microphones (directional, omnidirectional, and wearable). Only two microphones can be used at a time on the FLX2 system.